A row over a duck that threatened to derail the unveiling of a statue of a famous locomotive designer has been settled. The statue to rail engineer Sir Nigel Gresley, who designed the Mallard locomotive as well as the Flying Scotsman, was to have also featured a duck next to the eminent engineer. 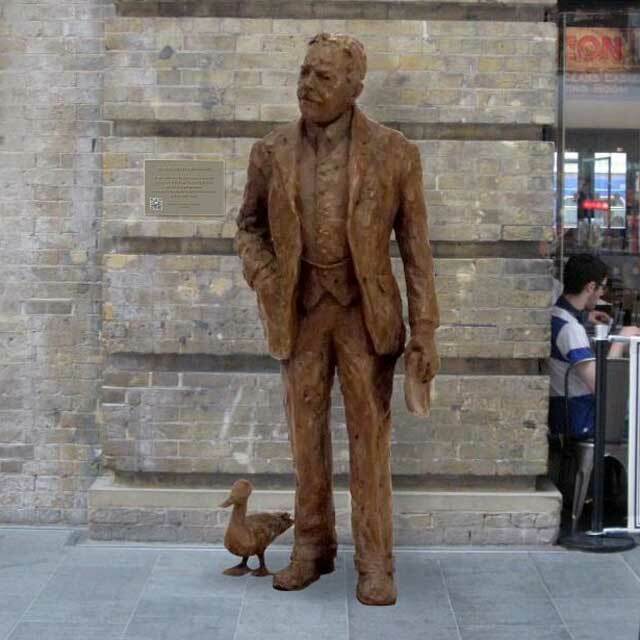 But Sir Nigel's family, and others, were not keen on the appearance of the duck with the bronze statue which is due to be unveiled at King's Cross station in London on April 5 2016, the 75th anniversary of Sir Nigel's death. And now the Gresley Society Trust, which commissioned sculptor Hazel Reeves to create the statue, has announced the duck will not appear. The trust's chairman David McIntosh said: "It was quite clear if we persisted with the duck we ran the significant risk of falling out with people whose opinion we valued." He added that Sir Nigel's two grandsons took the view that the duck "detracted from the dignity of the statue". Wow. That is all an open invitation to vandals and other European young. That statue ought to go through years with pink knickers on is head and all manner of shades of paint on its backside. To be so uptight about something so nice as that duck should bring out the full playfulness of every creative young man within a hundred miles. What with all the hysteria over every fire cracker this really is a golden age for pranksters. The stakes are higher, of course, but three cherry bombs today would be enough to bring in the military. I hope some other part of the city (maybe the city hall) just wants the duck. Sorry Sir Nigel, but you've been usurped. I'd like to think Sir Nigel wasn't as humorless as his descendants. The duck makes a dull statue memorable. An engineer with a sense of humour? Thank you for the information, Libby! I hope the campaign is successful.